The need of banks is undeniable in any economy. Banks are financial institutions which deal in money. It takes in money from those who are not using them at the moment and lends it to those who are in a position to use them for production purpose. There are a number of commercial banks in Bangladesh who are providing various kinds of banking services to their clients. Among these banks,there are local banks as well as some renowned foreign banks. Citibank, N.A. Bangladesh is one of the leading foreign banks in Bangladesh in terms of their services. Citibank, which operates under the umbrella of Citigroup, is the worlds’ leading financial organization. They are also considered as one of the most famous brands in the world. Branding is considered to be as one of the most important factors in this industry which can lead a firm to its peak. Branding in Citibank, N.A. Bangladesh is mainly carried out by the Corporate Affairs Department of the bank. The major responsibilities of this department are to maintain liaison with different organizations, especially with those who work in close proximity with Citibank, Bangladesh. This department is very crucial for the bank as it establishes relationship with other organizations in the corporate world. It also maintains relation with internal and external customer. Sometime there might be crisis situation that could be unheard of, that time this department takes active role to protect reputation and brand value of the Citigroup. Moreover, this department arranges various seminars and workshops and also takes the initiative in undertaking various training programs to enhance the knowledge of the employees regarding Citibank, its customers and suppliers. This report tries to find out the brand awareness of the Bangladeshi people about the multinational banks that are operating in Bangladesh, in this regard, a survey is being carried out. It is very clear from the survey that the Standard Chartered Bank is dominating the market for multinational banks in Bangladesh. This is mainly because of the vast and diversified services they offer to their clients. Moreover they are operating in the Bangladeshi market for a long period of time with huge success. They have been the pioneer in introducing many new products than any other banks in Bangladesh. Though being the world’s leading financial institution, Citibank, N.A. Bangladesh is also lacking behind mainly because of the lack of consumer banking in Bangladesh. People are more aware about the slogans and logo of Standard Chartered Bank than any other bank. 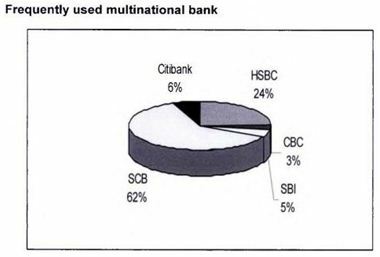 Most of them believe that reputation, financial stability, reasonable charges, service attitude of employees, technology adoption, global service network and new product innovation are the main reasons behind selecting any multinational bank in Bangladesh. They also consider that the multinational banks they are using are sufficiently providing these facilities in order to provide the best possible services. Citibank, N.A. Bangladesh lacks certain features that have hindered them to promote their brand image more successfully in the Bangladeshi market. Lack of consumer banking, efficient promotional efforts, intense competition, similar names of some local organizations, lack of inter-branch coordination and lack of detailed layout of the corporate affairs department can be considered as the leading factors for their branding problems. These problems can be encountered by implementing strategies that include introducing consumer banking, more extensive promotional campaign, restructuring of the corporate affairs department, gifts to clients, improving the layout of the office and more interbranch coordination. Generally by the word “Bank” we can easily understand that the financial institution deals with money. But there are different types of banks such as Central Banks, Commercial Banks, Savings Banks, Investment Banks, Industrial Banks, Co-operative Banks etc. But when we use the term “Bank” without any prefix, or qualification, it refers to the ‘Commercial banks’. Commercial banks are the primary contributors to the economy of a country. So it can be said that commercial banks are a profit-making institution that holds the deposits of individuals & business in checking & savings accounts and then uses these funds to make loans. Both general public and the government are dependent on the services of banks as the financial intermediary. As, banks are profit-earning concern; they collect deposit at the lowest possible cost and provide loans and advances at higher cost. The differences between two are the profit for the bank. Internship program is essential for every student, especially for the students of Business Administration, which helps them to know the real life situation. For this reason a student takes the internship program at the last stage of the bachelor’s degree, to launch a career with some practical experience. This report was prepared through extensive discussion with bank employees and with the customers. While preparing this report, I had a great opportunity to have an in depth knowledge of all the banking activities practiced by Citibank, N.A. Bangladesh. It also helped me to acquire a first hand perspective of the world’s leading financial institution. The objective of the internship program is to familiarize students with the real market situation, to compare them with the business theories & at the last stage make a report on assigned task. The main objective of this report was to have an assessment about the brand survey awareness of people about the different multinational banks in Bangladesh. To identify the brand consciousness about multinational banks in the minds of people. To identify branding problems of Citibank, N.A. Bangladesh. To suggest remedial measure for the development of brand image of Citibank, N.A. Bangladesh. The report is fully exploratory in nature. Data was collected from both primary and secondary sources. The target population for this research was the general people working not only in financial institutions, but also in service-oriented organizations, nongovernment organizations (NGOs) and also in government organizations. 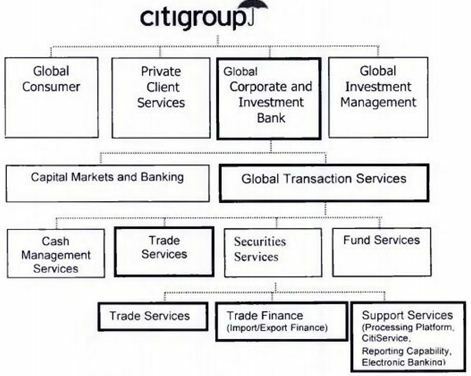 This citigroup was done in order to gather more accurate and non-biased information about the multinational banks in Bangladesh. The random sampling method was used to collect data from the people about their perceptions on the multinational banks in Bangladesh. The sample size was 100 people working in different sectors in Bangladesh. Data were collected from them with the help of a questionnaire. Corporate Banking group provides a comprehensive range of financial services including treasury management, transaction services, securities custodianship, foreign exchange, and corporate finance to corporate clients. Their expertise involves offering innovative and customized solutions to business and institutions, both foreign and local, by harnessing on their global capabilities to bring about world’s best practices for local capacity building. The corporate bank offers a one-stop solution combining lending & advisory services, treasury, cash management, and structured finance, to meet the specialized requirements of the customers. They are strongly supported by our international presence and interconnectivity in over 100 countries. Every customer at Citibank Bangladesh has an individual Relationship Manager who is responsible for both the day-to-day management of customers’ account and their future corporate needs. (b) short-term loan (a loan granted for an agreed period of time). These funding methods can be used to finance business specific needs such as working capital. The bank cover the entire spectrum of trade services for both imports and exports. Issuance of bid and performance bonds. The Vendor Marketing Program (VMP) offers trade services and financing to qualified vendors who export to reputed international buyers. Main product offerings are short-term trade related facilities for pre-export and post-export financing required by vendors for achieving efficiencies in their trade flow cycle. In order to qualify for participation, vendors must be an exporter of garments to reputed international buyers in USA, Europe and Asian regions subject to Citibank Bangladesh’s acceptance criteria. Structured finance deals with specific areas like Export & Agency Finance (EAF), Infrastructure & Energy Finance (IEF), Syndication etc. by combining world-class investment banking and commercial banking services. Drawing on its global expertise, Citibank offers to its customers a full range of customized financial solutions. In today’s competitive environment financial institutions are striving to be ahead by offering superior and efficient products and services. At Citibank Bangladesh, the bank understand customers’ needs and offer a range of correspondent banking services, which will help them to stay ahead of the competition. In Bangladesh, Citibank N.A. has three full service branches catering to the needs of FI customers – two in Dhaka, the capital city, and the other in Chittagong, the port city of Bangladesh. The bank’s team’s main objective is to liaise with the FI customers and overseas Citibank counterparts to offer seamless service. The bank’s back office handles pre-processing of FI payment instructions and reimbursement authorities and provides one stop customer inquiry handling services. They also confirm LCs for FI s that has credit lines with the bank. As a part of the world’s premier financial solutions provider Citigroup, Citibank N.A.’s Sales and Trading desk also strives to offer the world’s best treasury products to its customers at the most professional and competitive manner. As an acknowledgement of the banks’ continued dedication to serve the customers the very best, the bank have been ranked number one treasury bank by many international journals time and again. Limited night desk & watch order services to transact in currencies at clients’ expected prices. Citigroup brings their clients’ Cash Management solutions unrivalled among banks. No one else has the global capabilities and nor provide total solutions tailored to meet clients’ specific requirements. They are highly attuned to the clients’ needs and responsive in their actions. Adopting a partnership approach, their aim is to work with the clients’ as a trusted advisor in a professional relationship based on mutual respect. The premium Cash Management solutions offered by Global Transaction Services provide the answers clients’ need. To stay ahead of the competition, clients’ choice is clear-make the change to Citigroup and start reaping the benefits right away. 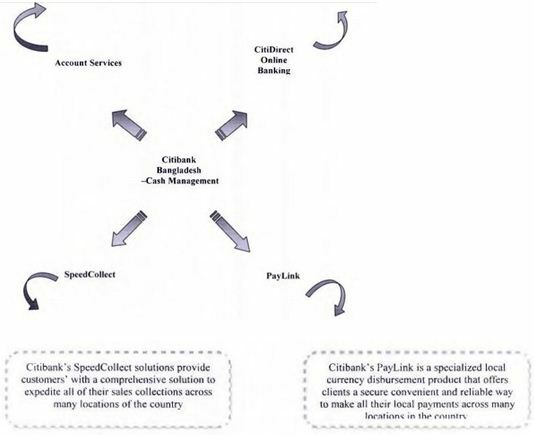 No one is better positioned than Citigroup to develop effective Cash Management solutions in Bangladesh. Citigroup’s Receivables Management Solutions use various collection channels to collect clients’ receivables quickly and at reduced cost, delivering their information through a variety of reports using the secure online banking platform. Citigroup’s SpeedCollect helps clients collect and manage local receivables across Bangladesh in simple and efficient way for better control of Cash flow. Citigroup’s Payables Management solutions improve productivity, security and control across the entire payments processing. Citigroup has the strength and vision to address clients’ payments requirements both now and into the future. PayLink offers a secure, efficient and flexible solution for managing domestic local currency payments. With Citigroup’s comprehensive Payables Management solutions, clients can outsource all non-core payments processes and free up skilled resources to focus on business development. Citibank leverages its global network and world-class technology to bring in remittances by non-resident Bangladeshis from overseas in a fast and reliable way and delivering the drafts in Bangladesh through dedicated courier network. Citibank has dedicated remittances professionals and customer service lines to answer queries of customers. Citibank N.A. brings a simple and convenient way to manage clients’ everyday banking needs. The Bank offers them superior MIS facility along with various investment options for their idle balances taking care of their entire daily banking requirement. Citibank offers their clients’ a robust operational infrastructure to handle large transaction volumes. The regional and global trade experts forming partnership with the clients deliver the best-tailored trade solutions that facilitate the complex process of cross-border trade transactions. Letter of Credit – whether an importer or exporter, the bank’s representation in over 100 countries will ensure that Citibank meet customers’ total Letter of credit requirement through opening, negotiating/discounting, advising, confirming, guarantees, reimbursement and foreign exchange services. Collections- Citibank offers flexible and efficient commercial and financial documents handling for both importers and exporters. It deals in documents against acceptance (DA-lssuance), Documents against payment (DP- sight), direct collection from export and import both fronts. The Trade Finance service encompasses import financing and export financing. Import financing is available under Citibank New York trade advance program and Citibank Bangladesh import loan facility. Export financing service include both pre and post-shipment financing of export contract. The negotiating and discounting of export documents is also available within this service. Customized reporting capability on trade products. The customers can carry out all their banking operations from anywhere around the world with their connectivity to CitiDirect Online Banking of Citibank. It is the banks’ award winning, web-based delivery platform, which is recognized worldwide in over 100 countries. The operation in this platform is flexible, secure and cost-effective with a capability to take care of all clients’ banking needs. CitiDirect Online Banking is a complete package for managing all customers’ cash collection and payment related transactions. It covers the process of payment from beginning-to-end as creation of payment instruction and, authorization of the instruction which reaches Citibank’s end instantly for processing. In today’s world of decentralized operations, this web platform offers the facility of remote authorization from any location. This platform serves all clients reporting needs relating to monitoring their sales collection account transactions. CitiDirect helps clients also for account reconciliation where they get the real time account statement. The trade service available in this platform offers customers the facility to track their trade documentation and Letter of Credit status in different transaction stages. Agency and Trust is an exclusive client service of Citibank N.A. that facilitates various types of complex financing solutions. The main task of the department is to maintain liaison with different organizations, especially with those who work in close proximity with Citibank, Bangladesh. This department is very crucial for the bank as it establishes relationship with other organizations in the corporate world. It also maintains relation with internal and external customer. Sometime there might be crisis situation that could be unheard of, that time this department takes active role to protect reputation and brand value of the Citigroup. Moreover, this department arranges various seminars and workshops and also takes the initiative in undertaking various training programs to enhance the knowledge of the employees regarding Citibank, its customers and suppliers. The Head of this Department is Ms. Mehreen Mahiuddin titled as Corporate Affairs Manager. This department is responsible to build and protect the bank’s overall reputation and image while proactively developing communication strategies to generate revenue that support the business objectives as well as maximizing the opportunities to promote the brand. Hard numbers are the least significant criteria in job evaluation, but are indicative of the overall size of the area of the bank’s activities, which the job has been designed to have its main impact upon. Headings are shown below of the more common measures. The following are the major principal accountabilities (major end-result areas), which describe the end results or output areas expected of the job. In other words, these are the main areas in which the job must deliver results in order to achieve its purpose. Citibank to be a preferred employer attracting the best. During any event of crisis, the media would look for news and as a result, the company must keep its channel open to press to feed the media with information updates. As soon as the company faces a crisis, it must have an internal meeting to review the situation. It should gather as much information as could be available. These information may include those from outside the company like different authorities, rivals etc. As soon as the situation is clear to the company, it should develop a line of communication and one person should be appointed to talk to the press. The spokesperson must have a clear idea about the happening and so, he should not give any impression to the press that he is not unaware about the developments. In case some one asks something which he does not know, he must admit it and say he will gather the information as soon as possible and communicate it to the inquirer. The company should also issue its formal press releases on the event. The company will also have a press conference, depending on the need, to clarify its position. In case some thing big happens and the press does not contact the company, it should voluntarily contact the media. While these formal channels would work, the company key persons would also contact the editors of the press and also open a second informal channel of communication. The Company also needs to brief the policymaking level about any crisis. For this, the top company persons must prepare a brief and then call on top important relevant persons and brief them about the situation. It will be necessary to mould the mind-set of the authorities because the press will also contact the authorities to get their reaction. Last but not the least, the company should also inform its staff about the event and tell them what to do. In case any of the company employees are affected by the crisis, the company must contact the affected persons, their families and share their concerns. ■ Development of regional marketing strategies, programs & sales and marketing tools in line with global marketing strategy, and provision of local input and feedback. ■ Create innovative marketing plans by means of direct mail, email marketing, internet marketing, and space advertisements. ■ Work on advertisement related campaigns for new products marketing. The bank has global procedures and policies in place to make sure there are no surprise stories about the company when people read the newspapers or watch TV. No one should speak to the media unless authorized to do so by country or regional public affairs. Each country, product/ business is responsible for its list of approved spokespeople this will include the CCO and country business managers, as well as the areas about which they may speak. All interviews must take place with a PR person present….making notes or recording the interview. Economists or analysts may be authorized as exceptions. The country public affairs office should be cognizant of all contact with domestic media in that country and all upcoming stories must be placed on the regional weekly story run which is then forwarded to Citigroup Public Affairs in NY. Regional public affairs should be informed of contact with international/regional media. Local issues or stories, which may run in regional media, must be discussed and approved with the regional public affairs office prior to accepting the request. In damage control or crises, regional public affairs will assist with damage containment and strategy. Direct requests from regional, international media including wire services must be approved by regional public affairs. Each country public affairs office is required to have a daily clipping service so that coverage can be monitored and managed. Significant clips are to be sent on a timely basis to regional public affairs. Press calls must be logged with the public affairs office and returned. There is no such thing as “off the record”. Everything said in the presence of a reporter is fair game. Everybody should tell the truth. There is no need to tell everything the bank knows. The bank doesn’t comment on market place rumors or speculation. The bank neither confirms nor denies possible acquisitions or divestitures until it are ready to announce them. The bank doesn’t comment on who is or who is not their customer. It respects client privacy – corporate, institutional and retail – and their legal rights. The bank rarely comments on regulatory issues and not without the approval of the CCO. The bank doesn’t speculate on job cuts, or discuss confidential staff issues. It is unlikely the bank would comment on success in fraud detection, safety or security procedures. The bank describes Internet banking to be as safe as banking through any channel at Citigroup. The bank tries to avoid commenting on competitors or being disparaging, even if offered the veil of anonymity. The bank doesn’t comment on money laundering issues. If customers get any questions they can call the PAO. The bank prefers names not ‘a spokesperson for the company’. The bank doesn’t offer gratuities to journalists or lead them to believe they will financially reward positive media coverage. Invitations to journalist educational trips must be sent to the editor. The bank ask journalists to call back figures and quotes they will use…only to ensure accuracy. The bank use public information. It doesn’t break down figures by country e.g. market share/customer accounts/profit. If they do decide to provide information that is not public, it must be first discussed with regional public affairs. There is the need to check if media will be present before any bank employee agrees to give a speech. If press will be there and are able to ask questions, someone from public affairs should accompany the employee. If the employee doesn’t know something, offer to get back to the reporter. All internal documents must be written with due care and attention – they have been known to leak. Only designated Citigroup spokespeople may talk to the media and these spokespeople must have undertaken media training as defined by Corporate Affairs. Citigroup/Citibank is frequently approached by various organizations/individual public/customers/government agencies on matters such as media, sponsorship, philanthropic activities, speaker opportunities etc. either as a source of information and comment or for donations and support on a range of issues. These broadly come under Franchise/Corporate Image Management Activities. As a company, we encourage co-operation where this helps achieve our business goals and is part of our overall strategy to position the Bank in a positive way. However, because of the decentralized nature of our businesses and the need to maintain consistency in communication across the organization, effective coordination of all franchise image related activities is vital. The external world views us as one organization and therefore it is crucial that comments made by one business do not have a negative impact on other businesses. As normal routine in business several requests to sponsor and / or support events will be reaching the Business Managers. Those that relate to the business (customer requests) or could prove useful to a specific business should be considered by the businesses and proposed to PAO for necessary approvals to support. If this entails any media exposure, the media guidelines will apply. In all matters where a franchise decision is to be taken, it must be referred to the PAO and CCO. The PAO’s office is to be informed about all sponsorships requests – for approval as well as to avoid duplication of support to the same organization. □ Events that involve the media (whether participating in the event or covering it) would fall into the media relations’ policy as listed above and must be coordinated with Corporate Affairs. Industry Fora approach our managers to speak and share views with the industry at large. These are areas where the franchise presence and views need to be emphasized. Such requests must be forwarded for approval to the concerned Business Head as well as the CCO & PAO. After judging for sensitivities from the franchise point of view, including media exposure, approvals will be given. Charitable and non-government organisations look for support in their good causes and hence seek financial assistance. In most cases the causes are worthy and the needs genuine. Given Citibank’s history and franchise reputation several of these NGOs will be contacting business managers on a personal and professional level. However our pockets are limited. Therefore, all such requests must be routed to the Corporate Affairs office to be viewed as a franchise option. □ Corporate Affairs will revert if the proposition could be supported and if so, by whom (the business unit itself / Corporate Affairs / Citigroup Foundation) as also the extent of support. □ For long-term proposals, Corporate Affairs will manage the relationships along with any Citibank volunteers in the local area. The Foundation allocates funds by country and region based upon a set of indicators including business revenue and customer base, new business needs, existing community programs and potential growth opportunities. The Foundation staff is sensitive to the varying cultures, priorities and needs of the countries in which we do business. Therefore we will work closely with the businesses in each region and country to fashion programs that meet our general guidelines as well as local community needs. Decisions will be made on the merits of each proposal, with priority given to proposals in the Tier I area as described below in Section IV. Since competition for available funds will be keen, countries are urged to submit proposals as early as possible. The Foundation’s three areas of funding are Financial Literacy, Educating the Next Generation and Building Communities and Entrepreneurship. Within and across those areas we will give preference to proposals that fall within the following guidelines. Priority will be given to programs that strengthen early, primary and secondary education so that all children are learning at high levels. The Foundation supports innovative teaching strategies that increase student performance, technology-based curriculum resources, and teacher training. The Foundation also supports economic and financial literacy and school-to-career programs that expand students’ skills, knowledge, and experience as they prepare for college and the workforce. College and university grants will be made to emphasize global business interests and strengthen our relationships at selected universities. Priority will be given to proposals that reinforce community-led efforts to revitalize low-income neighborhoods in Citigroup communities. The Foundation seeks to support community development organizations that focus on affordable housing, economic development, micro credit programs, workforce development initiatives and community infrastructure improvements. Grants may be made for arts education programs that enhance learning and increase student access to leading visual and performing arts institutions. We support community-based health and human service programs in Citigroup company locations. The Foundation also supports relief and rebuilding efforts in Citigroup communities affected by catastrophic natural disasters. Citigroup and the Citigroup Foundation prefer to solicit proposals from prospective grantees with demonstrated successes in the areas they fund. Unsolicited proposals will be accepted, but a favorable decision is less likely. The HSBC Group, one of the world’s largest banking and financial services organizations, had its beginnings in Hong Kong more than 140 years ago. Today, the HSBC Group has over 9,700 offices in 77 countries and territories in Europe, the Asia-Pacific region, the Americas, the Middle East and Africa. HSBC (Hong Kong and Shanghai Banking Corporation Limited) obtained license from Bangladesh Bank on 17 April 1996 to conduct banking business in the country and commenced formal banking operations on 3 December 1996 through opening a branch at Dhaka. In Bangladesh, the HSBC Group is represented by Hongkong Bank, which has its head office in Hong Kong and a holding company, HSBC Holding Pic, which is incorporated in England. Standard Chartered Bank a banking company chartered in England by the Royal Charter 1853 and headquartered in London. Standard Chartered Bank started its business in Bangladesh in 1948, opening its first branch in the port city of Chittagong. The bank increasingly invested in people, technology and premises as its business grew in relation to the country’s thriving economy. At present the bank has 6 offices in Dhaka Chittagong and Sylhet, including the country’s only offshore banking unit inside the Dhaka Export Processing Zone at Savar. In April 2000, Standard Chartered Bank PLC bought the global banking business of the ANZ Grindlays Bank Pic from the ANZ Group, following which the branches of ANZ Grindlays Bank Pic in Bangladesh became units of the Standard Chartered Grindlays Bank Limited. Standard Chartered’s services in Bangladesh, ranges from Personal & Corporate Banking to Institutional Banking, Treasury and Custodial services. State Bank of India is India’s largest bank with a branch network of over 9000 branches and 7 associate banks located even in the remotest parts of India. State Bank of India (SBI) offers a wide range of banking products and services to corporate and retail customers. State Bank of India the only branch of the bank operating in Bangladesh since 5 May 1975. State Bank of India was incorporated in India under State Bank of India Act 1955. The bank provides all kinds of commercial banking services. Bank Alfalah Limited was incorporated on June 21st, 1997 as a public limited company under the Companies Ordinance 1984. Its banking operations commenced from November 1st, 1997. The bank is engaged in commercial banking and related services as defined in the Banking companies’ ordinance, 1962. The Bank is currently operating through 104 branches in 36 cities, with the registered office at B.A. Building, LI. Chundrigar, Karachi. Since its inception, as the new identity of H.C.E.B after the privatization in 1997, the management of the bank has implemented strategies and policies to carve a distinct position for the bank in the market place. Woori Bank is a bank headquartered in Seoul, Korea. The bank was established in 2002, and includes the former Sangup Bank, Hanil Bank, and Korea Peace Bank. It was once called Hanvit Bank. Woori Bank is a part of the Woori Financial Group. In 2004, Woori Bank opened Gaeseong Industrial Complex branch, in Gaeseong, North Korea. Woori Bank, Dhaka branch is a branch of Woori Bank, Seoul, Korea (“Head Office”). Their branch was established in September 21, 1996 with a view to providing generous support to foreign investors, Korean investors in particular as well as to the prospective customers from all across the globe in general. Our vision is to emerge as the dominant banking institution in Bangladesh having a fast & visible presence in the region in the days to come. The branch plays a leading role in Bangladesh’s financial industry in terms of customer service, high speed operation, systematic loan procedure and the cutting edge superior IT platform to provide information & services to our customers. The National Bank of Pakistan has its headquarters in Karachi, Pakistan. It has over 1,200 branches throughout Pakistan. The bank provides both commercial and public sector banking services. It has assets worth $9 billion in 2004. Its subsidiaries include NBP Capital, NBP Modaraba Management Company, NBP Exchange Company, Taurus Securities, NBP Almaty et al. National Bank of Pakistan (NBP) a banking company incorporated in Pakistan. It commenced banking operations in Bangladesh as a foreign commercial bank on 31 August 1994 with a total paid up capital of Tk 100 million. On 31 December 2000, the total capital and reserves of the bank stood at Tk 136.2 million, which was not adequate in terms of the capital adequacy ratio requirements of the taka equivalent of $10 million. The only branch of the bank in Bangladesh is at Dhaka. Habib Bank Limited (commonly referred to as “Habib Bank”) is the largest bank in Pakistan. An extensive network of 1425 branches in Pakistan and 55 international branches makes the its the largest bank in Pakistan today. Habib Bank Plaza located in Karachi, Sindh is the formal headquarters of the bank. The bank has a large network outside Pakistan including USA, UK, Middle East, Asia Pacific and Africa. Habib Bank Limited a Pakistani commercial bank that started business in Bangladesh on 9 July 1976 with two branches, one at Dhaka and the other at Chittagong. The Commercial Bank of Ceylon is one of the leading commercial banks in Sri Lanka with over 100 branches. It incorporated as a public limited liability company in Sri Lanka on June 25, 1969, under the Companies Ordinance No 51 of 1938 and quoted in the Colombo Stock Exchange in March 1970. It is a licensed commercial bank under the Banking Act No 30 of 1988. In 2003 Commercial Bank acquired Credit Agricole Indosuez (CAI) operations in Bangladesh consisting of 2 branches in Dhaka and Chittagong and the 2 booths in Gulshan and Sonargaon. Commercial Bank, while continuing CAI’s strategy would further extend the reach and range of services in Bangladesh. Over a period, our bank would strengthen the retail banking side as well, for which Commercial Bank has made its name in Sri Lanka. Shamil Bank is incorporated in the Kingdom of Bahrain and has grown steadily since 1982 to become a leading Islamic institution with shareholding equity of US$ 338 million and assets under management of some US$ 2.1 billion. The Bank provides a diverse range of products and services that cater for the financing and investment needs of individuals and institutions. It conducts its business in strict compliance with the principles of Islamic Sharia. Shamil Bank is a subsidiary of the Dar Al-Maal Al-lslami Trust, one of the world’s leading Islamic financial organizations. Other shareholders include prominent Saudi and Bahraini entities and high net worth individuals. Shamil Bank of Bahrain EC, Dhaka is a bank that started business in Bangladesh as a branch of Faysal Islamic Bank of Bahrain EC (Islamic Bankers) in March 1997 after obtaining necessary permission from Bangladesh Bank. 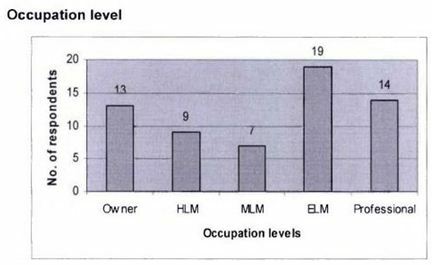 The sample population chosen for this survey was 100 people working in different sectors of the economy in Bangladesh. Out of 100 people, 62 of them participated in the survey by filling in the questionnaire which was given to them. 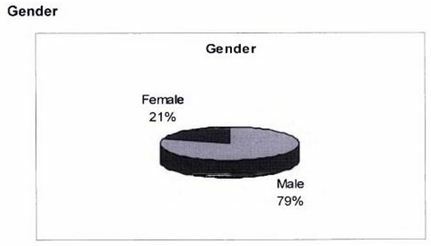 So the response rate is 62%. This survey has been conducted among people of different age groups. People below the age of eighteen years were excluded as they might not have yet entered into the professional world. 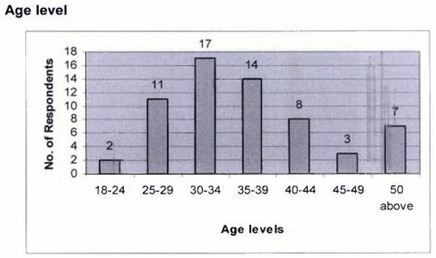 Most of the respondents seemed to be middle-aged persons while a few are above the age of 45 years. 49 respondents have completed their post-graduation degrees from different universities. 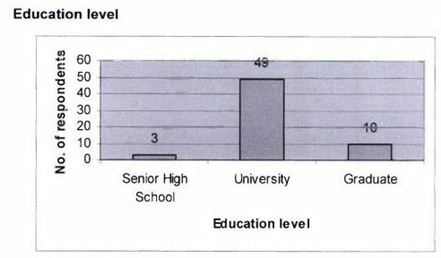 Only 10 of the respondents completed their graduation, while 3 of the respondents have only passed their high school degrees. Out of the 62 respondents, 13 of them have their own businesses in Bangladesh. 9 of them are employed in high-level management in organizations, 7 of them in middle-level management while 19 of them are currently employed in entry-level positions in an organization. 14 respondents are engaged in other professions like doctors, lawyers, etc. 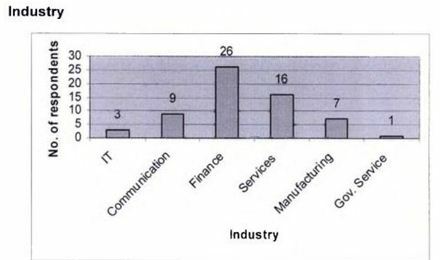 Most of the respondents belong to the finance industries and service-oriented industries, while the others are from IT sectors, communication industries, manufacturing industries and government organizations. Most of the respondents belonged to a monthly income level of between BDT 30000 to BDT 50000. 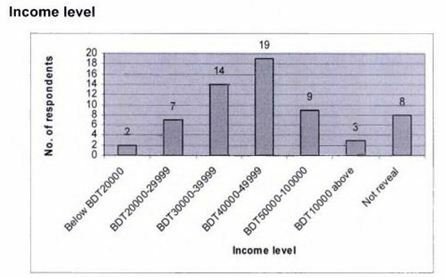 9 of the respondents have an income level above BDT 50000 while 3 of them earn more than BDT100000 a month. Some of the respondents have also decided not to reveal their income levels. Most of the respondents are using the services of Standard Chartered Bank which is considered the leading bank in Bangladesh. This is because of their diversified services, convenient operations and greater customizations. HSBC comes thereafter as the frequently used bank. While there are only few people who uses the services of Citibank, N.A. Bangladesh, Commercial Bank of Ceylon and State Bank of India. Though being the world’s leading financial institution, Citibank, N.A. Bangladesh is not so frequently used by people as they only perform corporate banking in Bangladesh for the last ten years. They do not provide the elaborate facilities that are provided by other commercial banks in Bangladesh. Commercial Bank of Ceylon and State Bank of India are also used by small number of people as because they have been operating in the market for a short period of time. It is very clear from the survey that the Standard Chartered Bank is dominating the market for multinational banks in Bangladesh. This is mainly because of the vast and diversified services they offer to their clients. Moreover they are operating in the Bangladeshi market for a long period of time with huge success. They have been the pioneer in introducing many new products than any other banks in Bangladesh. HSBC is lacking far behind when compared with the Standard Chartered Bank in terms of market share as well as services offered. Chartered Bank than any other bank. Most of them believe that reputation, financial stability, reasonable charges, service attitude of employees, technology adoption, global service network and new product innovation are the main reasons behind selecting any multinational bank in Bangladesh. They also consider that the multinational banks they are using are sufficiently providing these facilities in order to provide the best possible services. Citibank is the consumer and corporate banking arm of financial services giant Citigroup, the largest company of its kind in the world. Though being the leading financial institution in the world, Citibank, N.A. Bangladesh does not provide consumer banking in Bangladesh, but still they earn record profits from their limited operations in Bangladesh. This can be regarded as the major drawback of the bank. They only have corporate banking in Bangladesh which prevents them to get more close to the mass people. Their major functions include dealing with the corporate clients, international trade, etc. which keeps them away from the mass public. Dealing only with the corporate clients and foreign trade is not helping them to establish a solid rapport with the general people and thus the bank is failing to build a strong brand image in the market. Citibank, N.A. Bangladesh has shown strong commitment to the Bangladesh community by engaging in different types of community issues. They have worked hand in hand with Acid Survivors Foundation, Shakti Foundation for Disadvantaged Women, Bishwo Sahitto Kendro, Liberation War Museum, etc. and very recently promoted microentrepreneurs who have been successful in life by taking microcredit. These promotional activities successfully gained attention of many people, but failed to create a mass impact as many of these efforts did not have any emotional impact. They should engage themselves into such activities that would create more impact on people. Standard Chartered Bank has taken the largest market share in the banking industry in Bangladesh with their superior services and fabulous products. It will be difficult for any other multinational bank to create a better image than them. Citibank, N.A. Bangladesh will have to face intense competition from Standard Chartered Bank as well as from the other multinational banks in Bangladesh. If they even plan to start consumer banking, it will be tough for them to gain market share as it is already controlled by some major banks in Bangladesh. The City Bank Limited is a private local bank in Bangladesh whose name somehow resembles with the Citibank, N.A. Bangladesh. This creates confusion in the minds of people whenever they read any news about Citibank in any media. Moreover, to create more puzzlement, there is a local company in Bangladesh naming City Group of Industries whose operations are far more different from that of Citigroup and Citibank. These local organizations create problems for Citibank, N.A. Bangladesh as people misinterpret their names and may not comprehend the real brand. The Corporate Affairs Department in Citibank, N.A. Bangladesh is not properly structured. This department is responsible for all sorts of branding activities for the bank as a whole. Currently, only one person is taking care of this department without the help of any permanent employee. It creates more pressure on the manager of this department and sometimes might not perform at the best level due to immense work pressure. Many a times it can be seen that the Motijheel branch and the Gulshan branch is not harmonizing properly. Bills raised from Gulshan branch are sent to Motijheel branch for issuance of cheques. Instead of issuing them instantly, there is an unnecessary delay in the procedure. This does not ensure proper services to the clients and vendors as they do not getpaid promptly and hence degrades the brand image of the bank. If they introduce consumer banking in Bangladesh, more people will be aware about their brand and will learn about them. This is because consumer banking will help them to reach every part of the financial market and to the mass people with diversified products for their convenience. This will promote their brand name more rapidly than any other means. Citibank, N.A. Bangladesh should engage themselves in more promotional activities that catch the eyes of general people. For example, Grameen Phone has been successful in promoting themselves by sponsoring the national cricket team. Citibank, N.A. Bangladesh should try to promote their brand name in areas where people are more emotionally and mentally involved. They can also go for sponsoring events that are more close to peoples’ hearts like major cricket tournaments, national events like celebrating the Independence Day, etc. They can also organize many debate competitions and quiz competitions with university students to make them more aware about the bank. This sort of competitions involving university students will also help them to recognize potential future employees from the students. This department is particularly very important for any organization as it deals with branding. So if more experts are hired in this department it will help the bankers to divide job responsibilities and improve their performance. There should be more people employed in this department and roles and responsibilities should be categorized which will ensure more efficient branding of the bank. The layout of the office is done in an unstructured way. Employees do not have much space to move around. The bank should try to increase the amount of space for their employees by constructing a new floor or hiring a new building. A congested structure does not provide a good image to the customers of the bank and hence affects the image of the bank. It is very important that the Motijheel branch and the Gulshan branch should be working with more coordination. They should be working in a more organized way in order to provide fast and quality services to their clients and vendors in order to provide them with maximum satisfaction. This will ensure a superior brand image of the bank to the people. Performance Evaluation of Shahjalal Islami bank Ltd.